We’re driving to a three o’ clock game in Mayagüez, Puerto Rico, a town of decrepit wooden and metal homes in the rolling hills, three and a half hours from the steel bar hugging doorways of apartments in the city of San Juan, Puerto Rico. Coach David Santesteban is leading the University of the Virgin Islands soccer team to a historic season, but the traveling situation for the team has eight, athletic, determined university men squeezed inside one rental van. “This is unreal!” Coach Santesteban yells, directing a hand and his voice towards traffic in Puerto Rico. Speeding down the road, assertive with controlling traffic towards his favor , coach commands traffic. Coach speeds up the van, taking what little space he has in traffic and running with it. Suddenly he switches lanes in order to follow the lead van of soccer players from St. Thomas, and instantly becomes agitated. “Unreal!” Coach Santesteban yells out into the air again. It’s because after only three games traversing this island in a soccer convoy, he believes he knows this island like the back of his sun tanned hand. With experience playing the forward position in soccer professionally for the San Jose Oaks and San Francisco Diablos, scoring is second nature and winning is the ultimate goal. Now, although Coach Santesteban is a man of faith and pride, leading a young team filled with heart and ability, among the multiple things that annoy coach within a given day, following another car going in a circle is a big one. The University of the Virgin Islands needed someone with vision to spearhead the development of the soccer program after the completion of their new home field, but the result of what they’ve gotten in seven games has been historic. For the first time ever, the University of the Virgin Islands has made it into the post season. He’s a man with a last name that almost nobody on island can pronounce correctly at first try, but normally everyone just calls him coach. Only weeks from leaving his family temporarily in Houston, Texas, driving around island he’s already greeting folks on St. Croix with a honk. Coach is a religious man, which fits in with the Caribbean culture. He dresses sharp in his Sunday best clothes, and has dreams of new uniforms and boat shoes for his players. On countless occasions he’s chastised his players about how to properly behave in public. “We’re all in a fishbowl!” Coach preaches to his players after a win on the road in Puerto Rico. With a resume that displays a culture of success, coach understands how champions should present themselves, constantly comparing his team to Real Madrid, explaining how professionals behave themselves. With a team filled with upper-classmen, and lower-classmen at various skill levels, it has been coach’s job to get everyone on the same level, playing at the same speed. This is not an easy task for a coach, a month in to coaching at any university. At the inaugural home game on Oct. 4, coach led the UVI Buccaneers to their first win on their new home field. With a team comprised of 15 men, the UVI soccer team is relatively small with aspirations towards a championship. Most of the other teams have a bench filled with six or more players at a time for substitutions, while the Bucs on average have only two. That means more playing time for tired players on the road. Despite all the hurdles on the way through the 2014 season, the Bucs have played through it all because of the passion for the game. The passion that Coach Santesteban (santa-stay-ban) brings to the field can be seen on the side line and in practice. For a coach who tries to abstain from yelling too much on the side line, sometimes he can’t help himself. On Nov. 1, the Bucs played their first home game of the playoffs, but the refs didn’t give us home field advantage. By the 88th minute of the game, coach had enough with the refs and their bad time-keeping. Our players were kept on the field during a scorcher of a day almost 10 minutes longer than appropriate. In Spanish coach yells that the ref was extending the game in the other team favor. Immediately the ref raises his hand and dismisses coach from the last supposed two minutes of the game. Although coach might not always get what he wants on this team, he gets what he needs. Coach in frustration , takes his leave from the field, not before stalling at least 45 seconds from the game clock. At the end of that game, which resulted in a 1-1 tie, coach didn’t have much agitation in his voice towards the players. He knew that this team played with the pride of an island on their back, and with that he knew he was at the right place. All that waits now is the future of Bucs soccer in the playoffs and next season. Already the team has been accepted to new tournaments, and new players have taken interest. Bringing coach Santesteban to St. Croix has brought needed to change the culture and image of soccer at UVI, but even the coach won’t let you forget about the talented players on the team who sacrifice their bodies and time on the field for the Buccaneers. ST. CROIX- Scoring goals on and off the soccer field, sophomore Kimani George, a criminal justice major and co-captain of the Buccaneer’s soccer team, has proven himself to be a role model, not only to teammates but also to many in the St. Croix community. 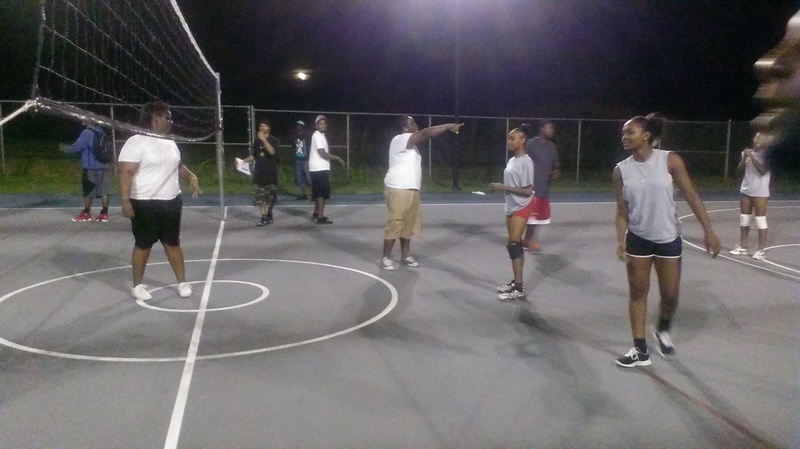 University of the Virgin Islands Annual Basketball Bush League. ST.THOMAS — The faint echo of balls bouncing on the court is heard over the chatter of players as teams warm up in the gym at the University of the Virgin Islands “Annual Basketball Bush League.” Players gather from all communities of the island in hopes of enjoying the game of basketball. ST. CROIX – University of the Virgin Islands’ Student Activities Supervisor Hedda Finch-Simpson recently announced that this year’s Spring Olympics was pushed back to April 25. Though the annual event was previously scheduled for March 21, the St.Croix Sports Committee had multiple issues that caused the event to be postponed. ST. THOMAS- When 19-year-old DeLanni Matthew was surrounded by friends who all wanted to become members of the Buccaneer’s Cheerleading Squad last Spring, she decided to give it a shot. Years ago, skirts didn’t exist to her. She would put up a fight whenever someone tried to get her out of her favorite basketball shorts. Now she can be found courtside shaking her pom poms in a tiny skirt. DeLanni Matthew before the 2013 Homecoming Game. To most of her friends, it was quite a shocker. “Are you serious, I don’t even know who you are anymore,” ToQuoya George, long time friend of Matthew, said. In junior high, when all the girls in her class were having conversations about hair and nails, she often stood out. Cheerleading, however, wasn’t the breakthrough for her. She didn’t quite fit the petite look of the majorettes you see competing in the World Baton Twirling Federation International Cup, but she practiced baton twirling each summer with the Lutheran Church of Reformation from the young age of seven. For this 5’9” computer science sophomore, the change officially began eight years ago. This was when she fully dedicated her heart to the sport and began twirling professionally. Matthew was one of the few Charter Members of the eight-time champions, the St. Thomas Majorettes, Inc. 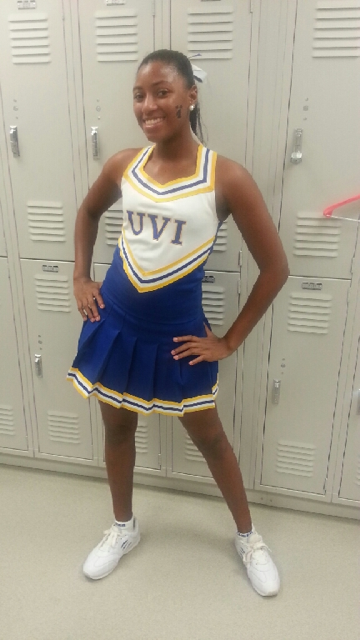 Even though she had been used to performing, for her, being a cheerleader was like being a totally different person. “Cheerleaders are supposed to have school spirit and be perky all the time and that wasn’t me,” Matthew said. To many, Matthew is considered a star performer. Her fellow cheerleaders look up to her and expect a lot. Outside of classes, she has been very involved in student organizations. She is known for her participation in the Social, Cultural and Carnival Organizing Committee in the 2012-2013 school year. 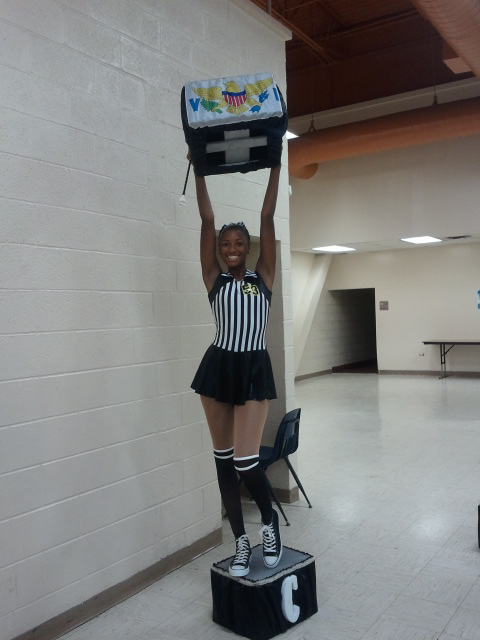 Many of her peers were granted an opportunity to see her perform in the Dining Pavilion during the First Annual Carnival Week in March of 2013. Matthew also enjoys reading, playing games on her iPad and most importantly spending time with family and friends outside of school and performances. 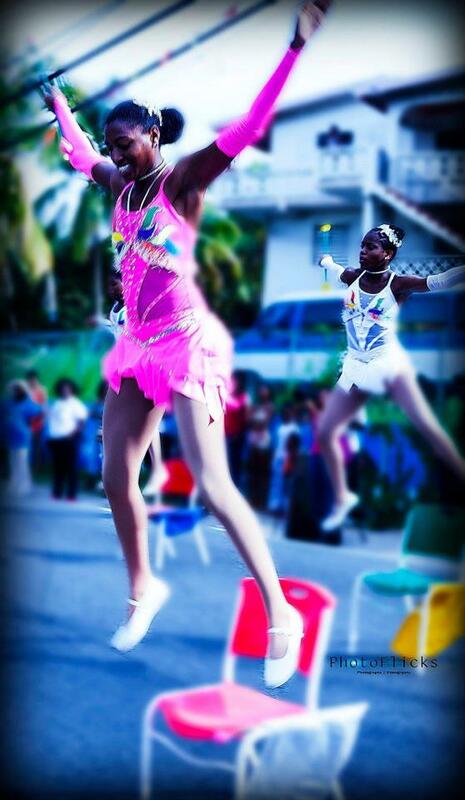 Though she is over the age limit to perform in the annual Carnival Children’s Parade whenever there is an opportunity to perform, on or off island, she goes for it. So when you see her around campus, baton or no baton, pom poms or no pom poms, feel free to ask her to show you one of her famous “Olympic” toe touches. If you get lucky, she might even teach you. Matthew poses before 2011 Paradise Jam Games. 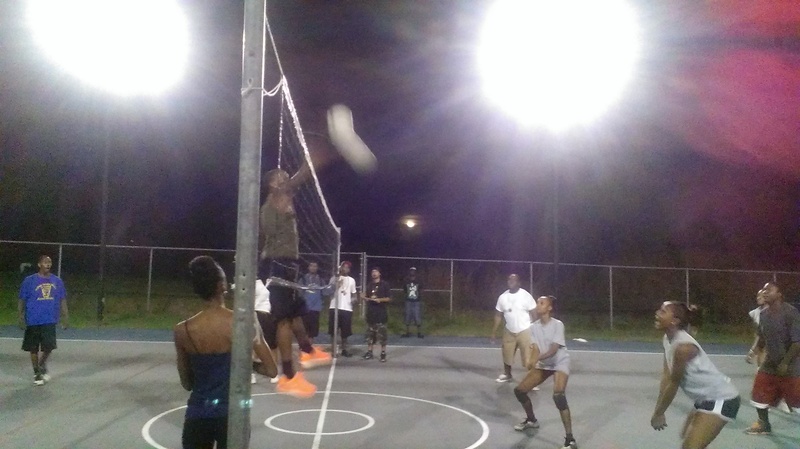 UVI Soccer Fields: To play or not to play? 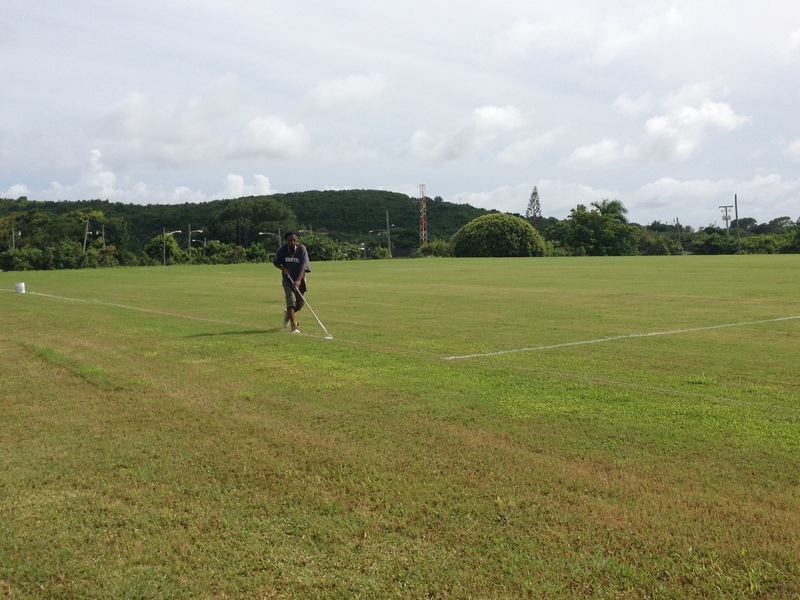 ST. CROIX— The two soccer fields on the Albert A. Sheen campus are not being used after being called “unplayable” which is putting a strain on the BUCCS soccer team. After three years of planning and construction, the university is doing maintenance on the fields such as cutting the grass and marking the field. The fields should be available to the players by November but no later than spring 2014. The Daily News published an article on Sept. 9 that called the UVI performance field “a field of dreams deferred.” It noted the condition of the field: the slope, the holes, the anthills and weeds. The field was “deemed unplayable” after a failed inspection from the Liga Atlética Interuniversitaria in August. Without the Liga Atlética’s approval, the field cannot be used for league matches. “The biggest impact” of that decision has been a financial one, as the university tries to “address concerns brought up in the report” said Nereida Washington, Director of Campus Operations on the Albert A. Sheen Campus. Travel to Puerto Rico for games can also get costly, but the decision impacts the students as well. In addition to being at a disadvantage in terms of support, the UVI students may also end up missing classes to attend games. Some team members don’t mind all the traveling or having to miss classes. They view the constant traveling as an exciting experience. “I like traveling to Puerto Rico for games” Ismail Yusuf, a freshman member of the soccer team said. Without a soccer field on which to play some of the league matches at home, the soccer team members have to travel to Puerto Rico for every game. Although some students view away games as a good thing, this constant travel could affect their performance in class since they will be missing so many classes and having to catch up. “The university is seeking to increase athletic and physical education opportunities for student athletes on St. Croix and the V.I.” Washington said. The soccer fields, one for practice and one for games, would provide those opportunities but they are not being used. Washington said “Intramural and athletic programs are key to your experience in [college]” so the university is working to make the fields ready for use. “There is no required inspection done by a body in order to play. We will use the Athletic director’s, the soccer coach’s [and other individuals’] evaluation of the fields to make sure that [they are] maintained properly so that [they are] playable,” Washington said. Despite UVI officials’ assurances that the field is “playable,” the university has been taking steps to improve the condition of the performance field. The primary measure is a process called top-dressing in which the holes are filled in with a mixture of soil and sand. The process would have to be done either “annually or biannually,” said Washington. The university marked the performance field and had the grass mowed on Sept. 16. Maintenance of the field involves processes such as reseeding, which is “recommended nine times a year,” Washington said. It also involves mowing the grass “twice a week” physical plant employee, Ephraim Rodriguez said. According to Washington, the university is well aware of these concerns and is working on them. A bleacher was purchased last year, although it was not put out because it would get in the way of field improvements. “The goal is to move in that direction where all these amenities will be available,” Washington said.